these days I had the need for a “Dusk to Dawn” switch completely electronically (without relay) and a made with just few components. I initially opted for a single transistor solutions, but unfortunately there were two drawbacks: the change of status was not quick but very gradual and the transistor generated a slight dropout that drastically decreased the brightness of the LED Strip. At this point I opted for a N mosfet and in this way the change of status much better and the dropout was just a few mV. 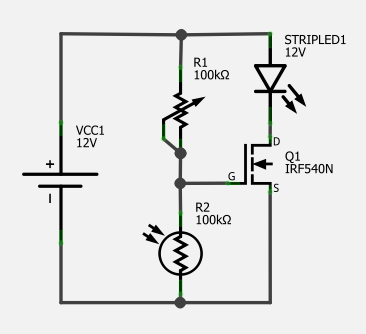 The operation is very simple: the photoresistor (LDR) has a value of about 100kΩ in the dark and when this is illuminated the resistance decreases and the voltage divider between R1 and R2, means that the gate of Q1 goes below the threshold level (between 2V and 4V) turning off the the Led Strip. With R1 I can set sensitivity, while reversing R1 and R2, I reverse the operation (it turns on with light and turn off with the dark). Today I want to show you a project really very simple but effective that can be used for various applications. This is a high resistance continuty sensor (current gain approximately 30000 times), based on the interesting Darlington NPN BC517, and very low cost. The basic design published here simply allows you to turn on an LED by touching or immersing in water two metallic elements (cables, plates or whatever), but “cloning” the circuit and putting more transistors and more LEDs, we can get a gauge with 2, 3, 4 or 30 sectors. It goes without saying nothing forbids to replace the LED with a relay in order to drive loads the most important. The operation is quite trivial: by touching the two contacts of the sensor “SENS” with hands for example, the weak current flowing through the body is sufficient to excite the transistor via the resistor R1 which serves as protection if we join directly the two contacts. The BC517 is able to amplify this current approximately 30,000 times, for which a current of 10 uA, is able to slide up to 300 mA through the transistor. The resistor R2 serves to prevent accidental starting by grounding the base of the transistor, while R3 is simply the resistor to limit the current flowing through the LED. Although simple, I believe that this project will be a starting point for other applications. Schema corrected: obviously one of the two leads did not go to mass but on the positive … I apologize for the mistake and thanx who rightly corrected me with his comments.